Although we may have seen tornado warnings for parts of Nebraska over Thanksgiving weekend, winter is coming soon which means cold temperatures, flying snow and ice. If you haven’t started preparing for winter already now is the time. Below are some reminders as you prepare your animals and farm for the upcoming winter months. 1) Face the opening of the calf hutches away from prevailing winter winds. Typically south to southeast is preferred in most Nebraska locations. It is critical during the first few weeks that a calf maintains its body temperature. When the ambient (environmental) temperature is outside the thermal neutral zone – the range in which a calf does not need to exert additional energy to warm up in the winter or cool down in the summer - of the calf, extra energy is required for the calf to maintain its body temperature. This energy should be used for growth and development instead of maintenance. 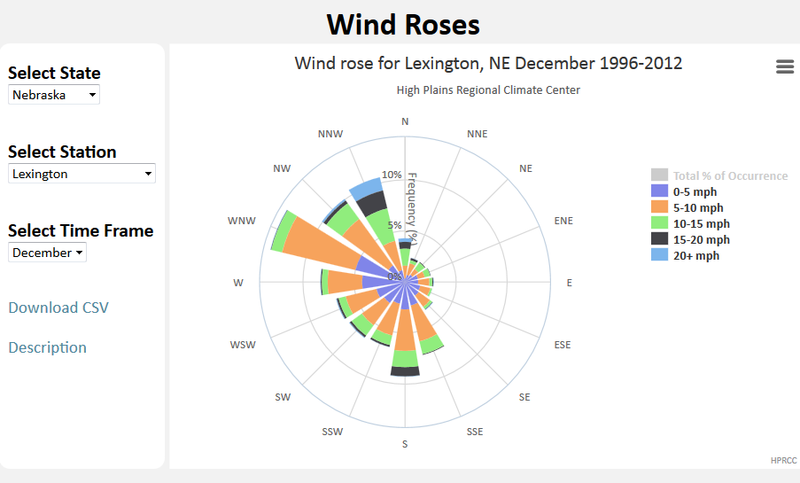 You can determine prevailing wind directions specific to your location by visiting http://www.hprcc.unl.edu/datasets.php?set=WindRose (see image below). Pay specific attention to prevailing winds above 10 MPH. Facing calf hutches east near Lexington would provide the greatest protection from wind. 2) Have calf jackets easily accessible and ready to use. If you aren’t already using calf jackets, now is the time to begin using them. Calf growth and development during the first two week is critical. Calf jackets keep calves dry and warm. 3) Move animals inside or provide a shelter from the wind. If possible, move animals inside a well ventilated barn. This will help protect them from the wind, especially calves that have a much lower percentage of body fat. Both cold weather and poor quality air will stress animals. 4) Ensure bedding is deep and able to wick away moisture from the animal and stays dry. It is important that animals be able to nest to help them maintain body temperature in the winter. It is equally important that the bedding remains dry. One solution is to put down a layer of saw dust or sand to absorb moisture and straw or wood shavings on top. 5) Ensure there is adequate feed supply to make it through the winter. Knowing how much feed is needed for the winter and storing the feed on the farm will eliminate the need to receive and store new feed over the winter months. 6) Check the heating on waterers to insure constant water access. Repair any leaks to avoid wet environments for animals. 7) Make building repairs including curtains and roofs. Over time leaks can happen in roofs and tears can happen in curtains. It is easiest to make these repairs while the weather is still mild and eliminates having to make the repairs during a snow storm or blizzard. 8) Perform maintenance of all farm vehicles and equipment. 9) Have a backup plan for hauling milk. It is always good to have a plan in place just in case the milk hauler cannot make it to or leave your farm. This should include a plan to clear roads leading up to your farm. 10) Provide employees with cold weather gear including a coat, hat, gloves, insulated boots and coveralls. They will appreciated it. You can never be 100% prepared for winter but starting with these reminders will help get your farm ready for the upcoming cold weather, snow and ice.